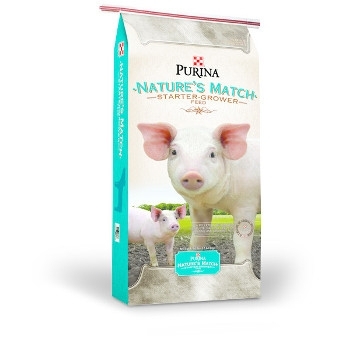 Nature’s Match® Starter-Grower Feed is a complete, all-natural pig starter-grower ration to supply all nutrients necessary for pigs weighing from 25 lbs to 100 lbs (Moderate Lean Potential) or 150 lbs (Hi Lean Potential). 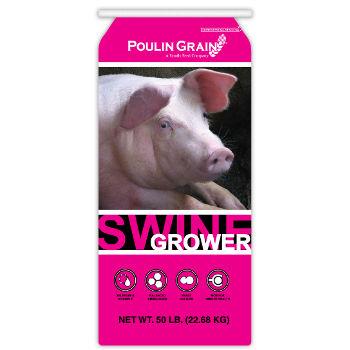 An 18% protein premium product that helps pigs transition to less complex grower-finisher rations. Designed to maximize performance and minimize waste. 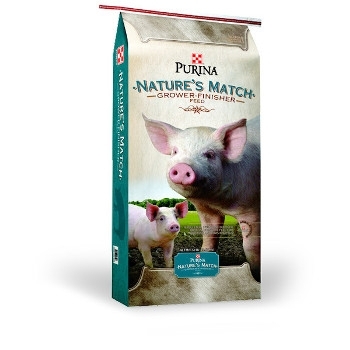 Nature’s Match® Grower-Finisher Feed is a complete, all-natural ration for growing-finishing pigs. 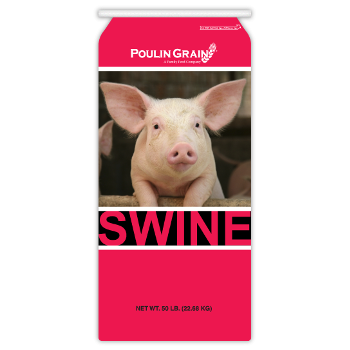 A 16% protein feed that provides balanced nutrition in a flexible feeding program driven by the genetic potential of your pigs. 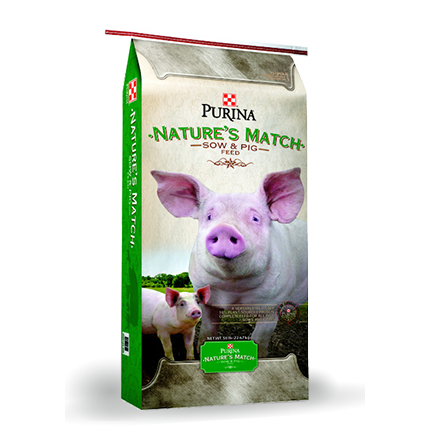 Nature’s Match® Sow and Pig Complete Feed is a versatile, complete, 16% protein, all-natural feed that provides all the nutrition from 25 lbs. to market weight, plus the breeding herd. 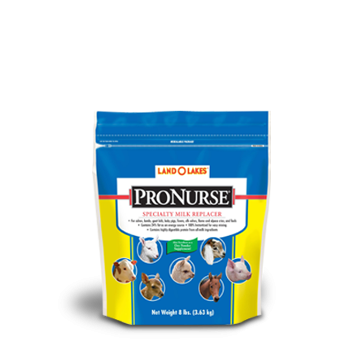 One product that can be fed to growing pigs, finishing pigs, developing gilts, lactating and gestating sows and boars. 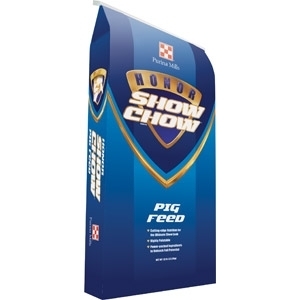 Honor® Show Chow® FINALE™ 809 feed is designed for growing/finishing pigs (adding cover and body) from 100 lbs. all the way to show. Honor® Show Chow® FINALE™ 809 feed is a moderate protein, high-energy feed developed for growing/ developing/finishing show pigs. Formulated for ultra-modern show pigs needing muscle, cover and body, FINALE™ 809 feed is a 16% protein, 7.5% crude fat, 0.85% lysine feed in a 3/32” pellet designed for greater intake.Honor® Show Chow® FINALE™ 809 feed is supported by Purina. Get your pigs on FINALE™ 809 feed today so you can unleash your genetic investment. 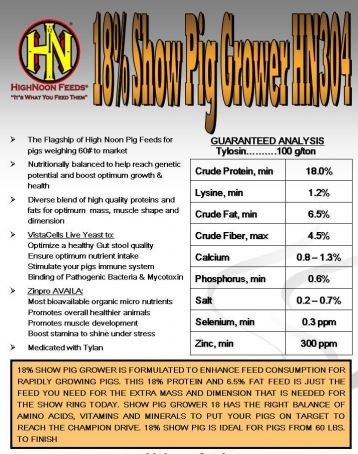 HighNoon Feeds 18% Show Pig Grower 50 Lb. The Flagship of HighNoon Pig Feeds for pigs weighing 60 pounds to market. 18% show pig grower is formulated to enhance feed consumption for rapidly growing pigs. 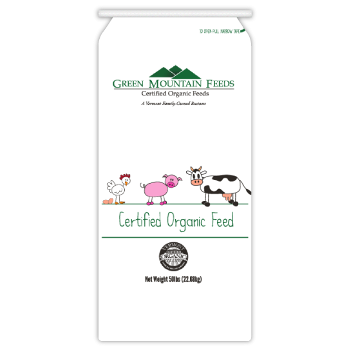 This 18% protein and 6.5% fat feed is just the feed you need for the extra mass and dimension that is needed for the show rnig today. Show pig grower 18 has the right balance of amino acids, vitamins and minerals to put your pigs on target to reach the champion drive. 18% show pig is ideal for pigs from 60 lbs. to finish. A complete pelleted diet for pigs 80 lbs of bodyweight and over. A complete crumblet diet for weaned piglets. A pelleted feed ration designed for growing piglets, hogs and a maintenance feed for sows and gilts. Feed pigs 50lbs and over at a rate of 4-8lbs/day or as a free choice maintenance diet for lactating gilts or sows. Feed non-lactating hogs 4-5lbs/day.